Let’s analyze the location and movement of the stars in elliptical galaxies. For example, we shell consider a galaxy № NGC1399, which received more attention in studies from modern astrophysics. What can tell us a map of this galaxy? Map of the galaxy can tell a lot, let’s try to read it. What is in common in elliptical galaxies? Elliptical galaxies contain most of the old stars, and a small number of young stars. These galaxies are smooth, symmetrical and very simple in structure. Let’s try to find patterns in the distribution and movement of stars in elliptical galaxies. Let’s consider the scheme of the galaxy № NGC1399 (Illustration № R-10.2). In the center of the galaxy there is a kernel consisted of the brightest stars. As far the distance from the center, the brightness of the star fades, it is characteristic of all elliptical galaxies. The reduce the brightness is described by a simple formula. If we’d connect the stars of equal brightness with one line – isophotes, these lines will draw ellipses around the center (or nucleus) of the galaxy. The directions of large and small axes of these ellipses are almost identical. Of course, there’s no absolute perfection, but in general the pattern is observed. What conclusions can be drawn from the facts presented? First, the different brightness of stars is evidence about their different ages. Young stars have a higher brightness. Secondly, The placement of the stars with the same brightness around the center of the galaxy and about the same distance from the center, as well as their motion to grow distant from the center, is a proof to the fact that the stars who lies on the same isophotes were born at the same time (they are at the same age) in the center of the galaxy, or near it. 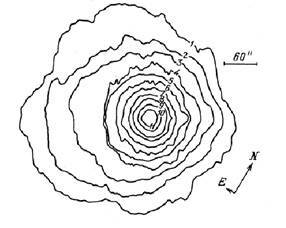 By distancing them from the center, we can conclude that the result of this movement was the explosion, which may have caused the birth of stars for this isophotes. Thirdly, given that the stars in different isophotes in the galaxy, has different ages, we can say with certainty that the stars of an elliptical galaxy are born from not just one, but from several explosions, depending on the number of isophotes. That means, that the explosions in the center of an elliptical galaxy, lead to the birth of stars and this process is repeated periodically. The number of such explosions can be determined by the number of isophotes. But it’s possible that the oldest stars crossed the stages of «white dwarfs», neutron stars, black holes and planets. In that case, it’s hard to determine the number of dynamic events (explosions), in the center of an elliptical galaxy, which led to the birth of stars. Therefore, based on indirect evidence, we came to a small logical chain of physical events that confirm the assumption of the birth of stars in elliptical galaxies, as a result of series of explosions. This is indicated by the form of elliptical galaxies, the existence of a «black hole» in its center, elliptical arrangement of stars around its center. Fourth, the position of the stars in the isophotes around the «black hole», claims that the stars that are distant from the center in isophotes were born earlier than the young stars, of the following isophotes, That means located closer to the center of the galaxy. Fifth, there is a connection between the location of stars in the isophotes and the distribution of these isophotes in the galaxy in terms of brightness. The brightness of stars in the isophotes decreases from center to the periphery, which indicates the birthplace of stars and the epicenter of the explosion at the center of the galaxy – in the «black hole». And it’s also indicates on the sequence of events – the explosions and the birth of stars. We still do not consider the possible causes and events that led to the birth of an elliptical galaxy. Taking in account the facts about elliptical galaxies, and the logical conclusions, which indicated by these facts, we can collect a small chain of physical events. In the early period of life, in the center of the future elliptical galaxy, there was a nuclear explosion, or a thermonuclear process has started. This led to a powerful nuclear explosion. As a result of this explosion, a gas, combined into stars, was thrown from the galactic center, in the form of these stars. Discarded stars have a direction away from the center of the galaxy and their rotation is around him. After a nuclear explosion at the epicenter, a «black hole» should remain. Under the influence of the vacuum of the «black hole», gas and dust from outer space are being absorbed into this vacuum volume and creates an «accretion disk». Once reaching the critical parameters for the mass that collected in the «black hole» and around it, there is another dynamic process happening, in the form of a nuclear explosion. This explosion also throws out the collected mass of gas and dust in the form of stars from the epicenter. At this point a new «black hole» is being formed. The process is being repeated. Between the explosions there is the time required to collect the gas and dust in the area of the «black hole». Stars ejected from the galactic center, moving around it, keeping the flow of gas in the «accretion disk» and getting away from the center by obtaining the kinetic energy of the explosion. The resulting angular momentum from the explosion should also affect the rotation of stars around the galactic center. Stars that are born in the explosion in the center of the galaxy, are aging and losing their brightness according to their distance from the center. With the aging and the distance from the epicenter of the explosion, the old stars go to the «red giant» state, the «white dwarf» state, to the «neutron star» state, to small black holes and eventually to planets state. They’re staying in outer space in the form of other space objects. In the center of an elliptical galaxy there is a bright nucleus, there’s a light located around it, while getting away from the center, its brightness decreases. This decrease in brightness is described by a simple mathematical formula. Illustration№ R-10.3 shows the distribution of the radiation brightness for elliptical galaxies, in magnitudes per square angular second. 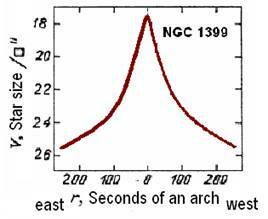 The distribution of radiation in NGC 1399. is demonstrating a typical brightness profile for elliptical galaxies. On the vertical axis the brightness is reflected (in magnitudes per square arcsec) in points on a line that passes through the center of the galaxy in the direction of east – west.